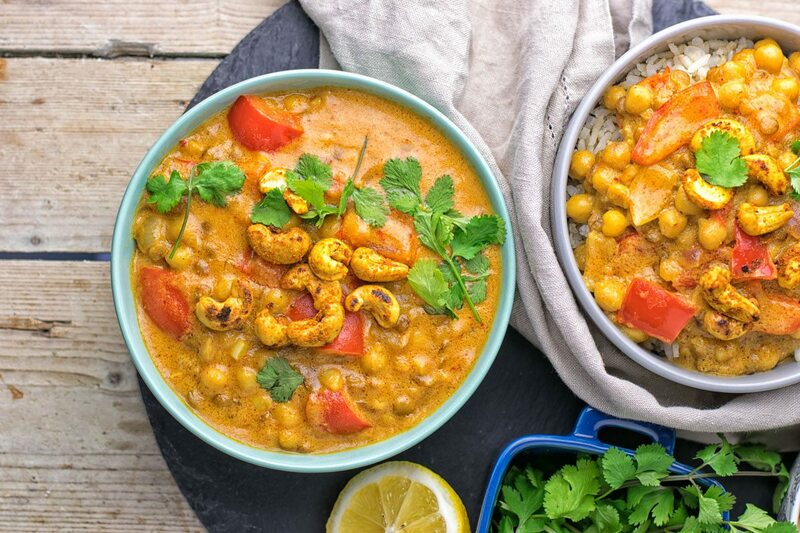 This Lentil Chickpea Yellow Curry is vegan and gluten free and you can make it with just 6 ingredients in 2 easy steps. Get ready for the most incredible, delicious plant-based meal. Lately I’ve been craving curries. 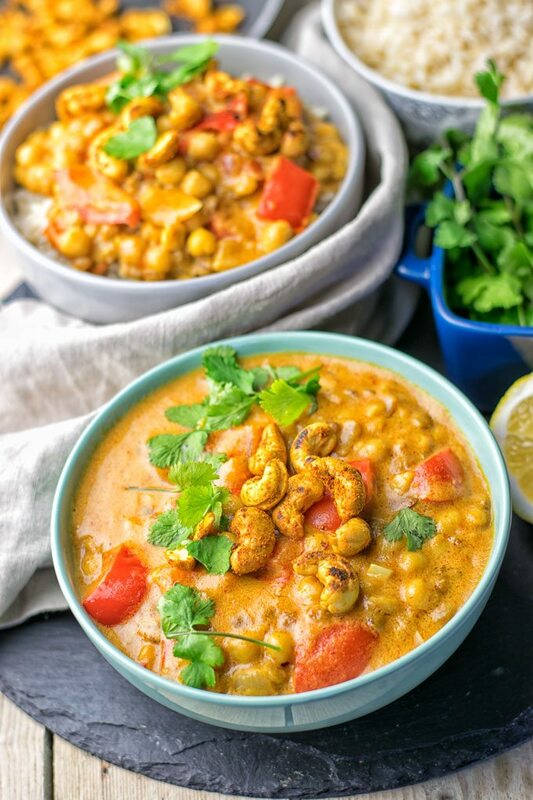 Just the thought of a big bowl of my Vegan Thai Coconut Soup with Naan Bread, or even a curry in the form of a big sandwich like my Thai Green Curry Sandwich and I’m already hungry. And today we add a new stunner to this, friends! 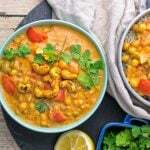 Drum rolls: here is my Lentil Chickpea Yellow Curry. It is seriously the best curry ever, no joke, no kidding or false exceptions. 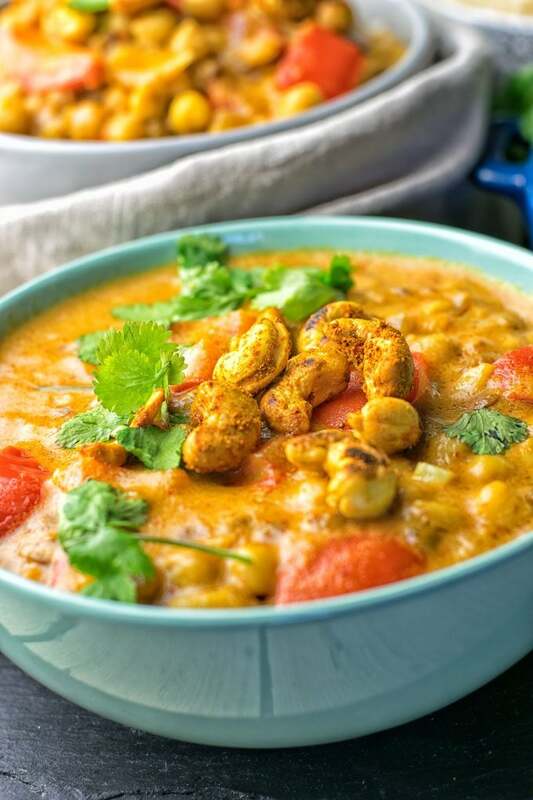 It is a mouthwatering dream in a bowl, warming, curry infused, satisfying, full of flavor, creamy, drool-worthy, and so addicting. Heat a large casserole. Use a bit coconut oil or just vegetable broth for frying the onions and garlic. Do this for at least 3 minutes, before you add coconut milk and lentils, yellow curry paste. Then cook this for 20 minutes – please not longer. We don’t want the ingredients mushy or overcooked. Just 5 minutes from the end, add chickpeas. Last easy step: Choose your optional add ons and customize your curry to your liking. Serve into bowls and enjoy! One remark about the yellow curry paste: please make sure the one you use is vegan friendly. Check the ingredient list as I always do, so you can be sure. In the end, you will seriously have the best curry you’ve ever make. The combination is the key: just 6 easy pantry staple ingredients and 2 easy steps you have this ready. And all your options are countless, you can choose your favorites to build your dream bowl. Cooking this according to the ingredient list, this will make a really big batch, friends. But no worries, if you have leftovers, they taste even better the next day. This is a dish you can take with you to work, serve it at potlucks, get togethers. On cozy nights, it will warm your soul, thanks to the infused curry flavors. I served this recently at a potluck on the evening for dinner. Just whip that all together in no time and bring it on. All my friends were hooked and so in love with this curry. So this is the dish you can serve your pickiest meat loving friends, for real. I don’t meet a person who doesn’t love curry. You can serve this plain, with rice, quinoa or with my favorite, the Roasted Garlic Naan, which is vegan, glutenfree just 6 ingredients and done in 10 minutes, so this is a keeper, less effort for maximum taste, friends. Only recently I stumbled upon something which is definitely a to go pantry staple for me. Let’s talk about coconut milk. Do you know that coconut milk can help you to loose weight and build muscles. So the fat it contains is really healthy and good for you, may prevent diabetes by controlling your blood sugar levels and much more. But that’s not the whole package here. Thanks to the Yellow Curry paste you can feel the heat and get the benefits of eating spicy food. You get the picture it’s not only incredibly delicious and easy it has so many good for you selling points, so dive in and enjoy! Curious about reasons to make coconut milk a staple in your house, then check this and read “Coconut Milk Nutrition – 9 Benefits + Recipes“. Let’s warm up, friends! 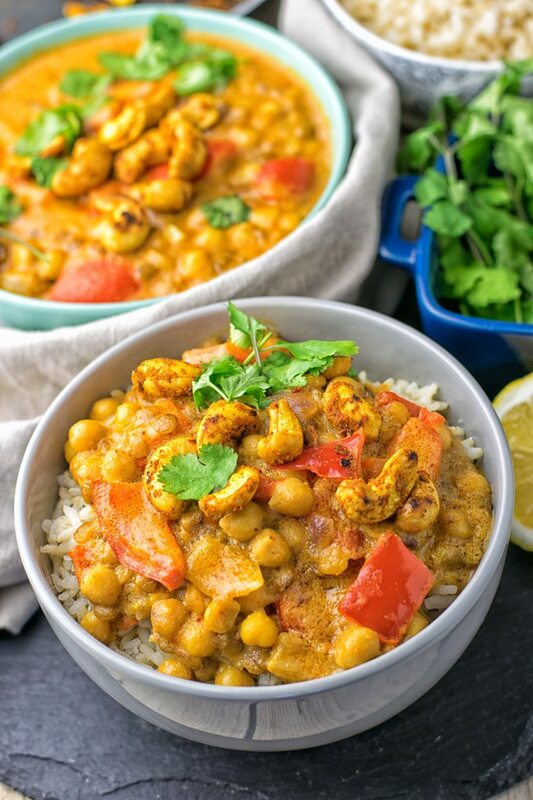 If you give this Lentil Chickpea Yellow Curry a try, snap a picture and tag me on Instagram and Facebook so I get excited to see all your flavor wonders. Heat a large casserole. Use a bit coconut oil or just vegetable broth for frying the onions and garlic. Do this for at least 3 minutes, before you add coconut milk and lentils, yellow curry paste. Then cook this for 20 minutes – please not longer. We don’t want the ingredients mushy or overcooked. Just 5 minutes from the end, add chickpeas. I definitely want to try this! My kids all love lentils, and I’m always looking for new ways to use them! Awesome Michelle! Let me know what you think! I absolutely love this recipe. I’ve made this 4 or 5 times. Can’t go wrong. So easy and so delicious! Thanks so much for your amazing feeback, Kim! One of my favorites! I made it all the time. I hope you’ll find lots of more recipes to try. I am always looking for a veg dish full of flavor to satisfy the carnivore I feed! This is a must try! Happy to help, Beth! I hope you get the chance to try it out! I love curry so much and eat it weekly! I could definitely go for a bowl of this deliciousness right now Florian! Love the bright beautiful color curries have too. Lentils and curry go so well together too. I would definitely add the lemon juice and bell peppers. Lemon or something acidic is definitely that complete finishing touch to curries, mmmm. Getting hungry now! The pictures look amazing and colorful! Hi Annie! I used green lentils! Let me know if you give this a try. love the roasted cashew added on the top and i am sure would love the recipe once i make it. cheers to this mate! Amazing, I tried this last night <3 super easy and delicious. THANKS! Thanks so much for your amazing feedback, April! That makes me really happy! Can you use curry powder instead of paste? Hi Jena! Of course you can try, but I don’t recommend it. I guess one needs to adjust the amounts a lot and it will change the taste too much and I can’t vouch for the results. If you do this, please let me know. I’m excited about your result. Hi Roro!Thanks for your amazing feedback! Glad it was a hit! Did you use dry lentils or canned? Hi Lauren! I used dried! sorry if this is a silly question, but do I have to soak the dried lentils overnight or something before using? or just pop the dried lentils in? Hi Kate! No need to soak the lentils! You can rinse them before cooking to the directions. Hope that helps! me and my family just ate this for dinner! It was absolutely delicious. We were unable to find a curry paste though so we had to use a curry sauce from the bottle. Since this was adding additional liquid, I ended up only using 1 can of coconut milk. We put chopped green onion on top instead of Cilantro because we didn’t have any and did 1 cup of lentils instead of 1/2, so it was a bit more filling. I was full after one bowl and felt great. (My family just started the move into veganism, after being vegetarians since I was baby). So happy to have found your website! Thanks so much for your amazing feedback! Glad it was such a big hit, that makes me really happy! I haven’t tried it myself, so I can’t vouch for accurate and precise results. But honestly I think it might be a better option to cook a batch and store it in the refrigerator. It will stay fresh for up 5 days and the flavors will be better than freezing. I guess it will work with freezing but you will miss some flavors. The result will be less flavorful, not intense and robust. If you try this I’m excited to know your experience, let me know. Hi Jasmin! Thanks for the feedback! Glad it was a hit! Can I substitute peanuts for the cashews? Hi Krysti! This will work fine! Of course feel free to use peanut butter! Hi Florian. I have only now come across this recipe and would love to try it veey soon. I have questions though 🙂 I would like to use dry chickpeas obviously soaked previously in water and cooked..what quantity shoulď I messure? The lentils you used were the green, would the brown or even orange ones be good too? And what ingredients would you use to make the curry paste? ? Chickpeas roughly double their weight once cooked. The amount of chickpeas in drained can is about 1 1/2 cups. As the chickpeas vary sometime it is safest to cook slightly more than you need. I suggest that you cook 1 cup dried chickpeas and then measure out from there the cooked chickpeas. Leftover chickpeas can be stored in the fridge for up to 2 days and can be used in soups, stews and salads. 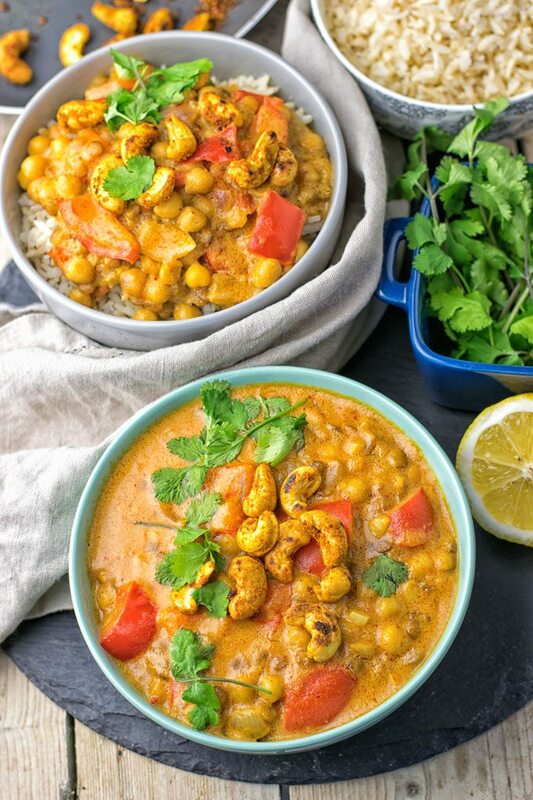 For suggestions for curry paste, take a look here https://www.contentednesscooking.com/turmeric-curry-with-spicy-lentils/ for ingredients. I guess brown lentils can work, orange ones not so much since they tend so be too soft. Looks awesome – would low fat coconut milk be okay? Or a 50/50 mixture? Hi Annie! Should be ok! Just made this tonight. I couldn’t find yellow curry paste so I used a Korma curry sauce and added the whole jar. I increased the lentils (red) to 1 cup. I also added a bell pepper and at the end added handful of spinach and lemon juice. I LOVED it. Very tasty and filling. hi Dorothy! Thanks for your amazing feedback! Glad it was such a big hit! I made this tonight – so good! Filling and rich. I used red curry paste. I also roasted the chickpeas before putting them in the curry. I’m passing this recipe on to my daughter – I know she’ll love it! An easy, quick (and inexpensive) meal is perfect for my college girl. Hi Rosanne! Thanks for your fantastic feedback! Glad it was such a big hit! Really hope you’ll try lots of more recipes. Fabulous recipe, and super easy. I couldn’t find yellow curry paste so used curry powder. Thanks so much for your amazing feedback! Glad it was such a big hit! Just made this … yum! Seriously rich and flavor-full, and you get the protein and the fiber from the lentils and chickpeas … plus the other health benefits you mention above. So good! Thanks for your great feedback, Kat! One of my favorites! This recipe looks beyond delishous!!! Wich kind of lentils did you use? I guess RED LENTILS right?? Hi Sibylle! I used green lentils! Hope that helps! I made this and it was delicious! I added a can of lentils instead of dry and thickened it with chia seeds. I’m making a double batch next time. Wow! So easy and yummy. Next time I’ll also add a red capsicum for some colour and crunch. Thankyou Florian. Thanks so much for your fantastic feedback, Bindi! One of my favorites! I hope you’ll find lots of more recipes to try! Hi I made this recipe and it turned out great! Super tasty. However, it’s a bit rich and I’m trying to lose weight. I’m wondering what your thoughts are on subbing one can of coconut milk for veggie broth instead? Hi Neha! I would say it might work, but it will turned out less rich and creamy. I would say use low fat coconut milk, almond or any other plant based milk. Wow! I just made this recipe on Sunday and it was so good. I added some vegetable stock since I wanted it more liquidy and I omitted the garlic and it was still delicious. 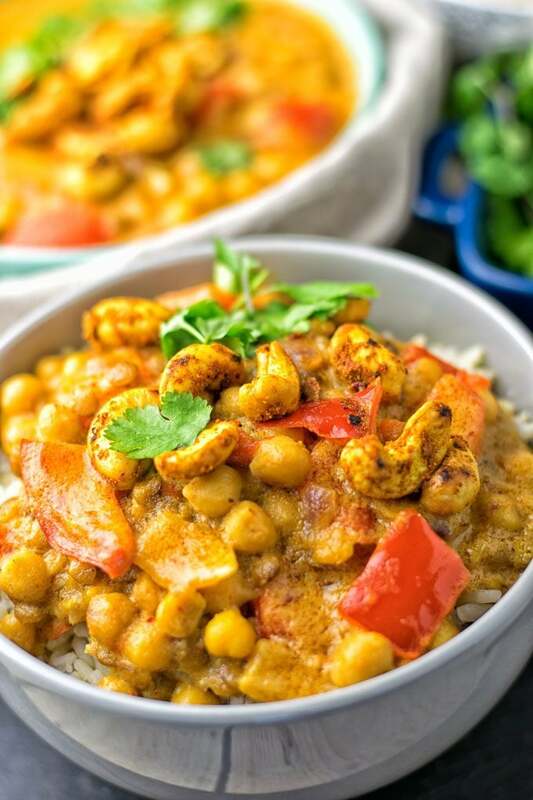 My husband usually doesn’t like when I make curries but he really enjoyed this one. Thanks for your amazing feedback, Noelia! Glad it was such big hit with you and your husband! I hope you’ll find lots of more recipes to try! Hi there! i only have whole brown lentils or split red lentils! will either of these work too? which out of the two would you recommend? Hi Lulu! Use brown lentils, red will get mushy! Let me know how it goes! Looks super delicious! I would love to make that! But is there any good substitute for the coconut milk you could think of? Hi Jule! I’ve never tried that before but I guess cashew milk will work! Let me know how it goes! In the photo it looks like there might be tomatoes in the dish but they are not listed in the ingredients. Is the photo realistic? of course the photo is realistic. What you see are not tomatoes but the optional chopped red bell pepper. It was amazingg! so happy i tried it out! Thanks a bunch for your amazing feedback, Catalina! I hope you’ll find lots of more recipes to try! Hi Inge! I used dry lentils!